In spring 2013, the movie “42,” starring Harrison Ford and Howard Alum Chadwick Boseman, hit theaters nationwide. The biographical sports film provided an inside look at how one man went up to bat against the racism infused in America’s favorite pastime. Jackie Robinson’s patience, humility, and self-control as a Brooklyn Dodger is what helped knock the color barrier out of the ballpark. 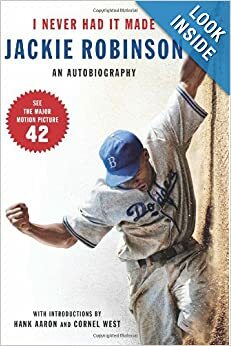 The movie primarily focused Robinson in 1947, his first year with the Dodgers. But in Robinson’s autobiography, I Never Had it Made, published the year he died, Robinson reflected on a lot more than his life within the diamond that first season. In fact, his book is only partly about the years he spent integrating baseball. The seemingly demure Robinson in 1947 became more vocal over the years, after proving he had the skills to support his having a position on the team. Robinson was more than an athlete. He was a brother, a son, a father, an activist, and a businessman, eventually challenging not just the rules of the game but also sportswriters, activists, politicians, and even a few of the presidents! His autobiography explains each of those parts of him and how he consciously connected them for the advancement of African-Americans everywhere. Robinson was a celebrity who never lost sight of the big picture. For him, it had always been bigger than himself, than baseball. Despite his (or any other African-American’s) success, Robinson was aware of the strides that still needed to be taken. Being a famous ballplayer didn’t suddenly allow Robinson access to better neighborhoods or immunity from discrimination. Nor were those things given to his children, his family, his friends. He was recognized by white America as great for his talent and the money he could bring in but he apparently wasn’t great enough to be treated as a first-class citizen. And Robinson knew that to be the case for other black motivational success stories also, often spewed to condemn African-Americans for not following suit. Like Lena Horne, Ralph Bunche. “Name them for me. The examples of blacks who ‘made it,'” Robinson challenged. “For virtually every one you name, I can give you a sordid piece of factual information on how they have been mistreated, humiliated.” And he did. What’s refreshing about this autobiography is it’s honesty. Throughout the book, he candidly admitted things he would have done differently, such as finding an all-black neighborhood to raise his children, and passages he debated including in the book, like the Freedom National Bank issue. He did not live in a diamond-shaped vacuum. Robinson understood all of the factors that played a part in his success, from Branch Rickey to the black press. He frequently wondered about the identity issues his loved ones often faced in the shadow of his fame. His thoughts on and interactions with both Malcolm X and Martin Luther King, Jr., as well as his correspondence with Richard Nixon show that he was knowledgeable about politics and the issues of the times. I Never Had it Made was about more than the game. This is not another sports story. It’s a story about what it meant, and still means, to be black in America. Within the pages of this autobiography, written in 1972, could very well lay the foundation of a civil rights movement reformation. I’ve actually had this book for years, but haven’t read it yet. Now knowing that it goes a lot deeper than just his experiences in MLB has encouraged me to pick it up. I plan on giving it to my students as well. Yeah, he covers the majority of his MLB experience in like the first quarter of the book. The rest is a look at all the other aspects — which I had NO IDEA about. He did a LOT in his lifetime. Let me know what you think!! !